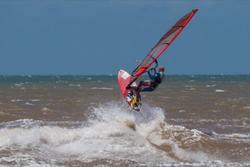 A windsurfing or kitesurfing holiday to Africa offers a continent of huge cultural contrasts and no area more so than North Africa. Each destination has conditions to suit every level and whether you are a keen windsurfer, kitesurfer with scuba divng, SUP and surfing. Brazil has outstanding windsurfing holiday & kitesurfing holiday locations with choice of 3 destinations - Jericoacoara, Icarazinho and Gostoso. If you want to look a bit further afield consider Los Barriles in Mexico on the Baja California peninsular. All are oustanding venues and provide you with the chance to have your own South American adventure. The volcanic islands of the Canaries offer a windsurfing holiday and kitesurfing holiday location, surfing, SUP, scuba diving plus year round sunshine and superb conditions. Each of the islands has a distinct character of its own. 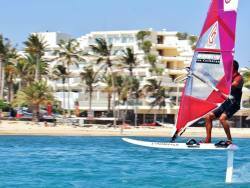 For your Cape Verdes windsurfing holiday or kitesurfing holiday, head 450km off the west coast of Africa to Sal and Boa Vista island for the best conditions. These islands are directly in the path of the Northeast Trade winds which makes this destination and ideal winter windsurfing and kitesurfing holiday destination from November through to late April. Any time of year there is always one or more exotic Caribbean Island to choose for your windsurfing or kitesurfing holiday that has the Tradewinds creating amazing conditions. The winds are predominantly at their best in the south during our winter, with the northern islands benefiting during our summer months. The Greek Islands consist of over 1400 islands flung across the Aegean and Ionian seas, 160 of which are permanently inhabited. There is no such thing as a typical Greek island, as each has its own characteristics. Situated on the Eastern edge of the Mediterranean, Cyprus offers multiple sporting activities including windsurfing, kitesurfing, scuba diving, sailing, tennis and golf. Indian Ocean or Far East, most are subjected to unique climatic conditions both wind and weather wise. Nearly all the towns and villages are on the leeward side of the island, sheltered from the ravages of the elements. There are few areas of mainland Spain, perhaps in the whole of Europe that can hope to match the wind that Tarifa enjoys. In the Golf de Roses the bay has a huge long stretch of sandy beaches with the Tramontana in the Spring & Autumn and local thermal (Garbi) in the Summer. Turkeys Aegean coastline is truly magnificent, rugged cliffs, tiny coves and long sandy beaches, lapped by clear blue water, with bright sunshine cooled by the Meltemi wind.